We have a very exciting young group next year and we look forward to getting started. The Lady Vikings will continue their quest for a State Championship today as they take on Bishop Lynch at 4pm at Southlake's Dragon Stadium. With an 8-0 win over Houston's Awty International to claim the Area title and a 4-0 win over Houston's St. Agnes to claim the Regional title, their 27th overall, the Lady Vikings look to advance to their 20th State Championship match and claim their 5th State Title. In the other State Semi-Final, Ursuline takes on San Antonio's Incarnate Word at 1pm at the University of Mary-Harden Baylor. The TAPPS State Final Four Semi-Final match against Bishop Lynch has been moved to Wednesday. Kick-off will be at 4:00pm at Southlake's Dragon Stadium. The Lady Vikings took complete control of their regional round playoff game this afternoon from the opening whistle to the very end and St. Agnes was the unfortunate opponent. Gwennie Puente scored the games first goal as she put the ball in the near post top corner about half way through the first half. Even though their were no more goals scored in the half, the Lady Vikings kept the pressure on outshooting the Lady Tigers 9-2 within the first 40 minutes. LVS head coach, Jay Fitzgerald said, "What a start for our team, we didn't let them breath." The Lady Vikings were dangerous in all areas of the field creating chance after chance. Six of those chances were corner kicks and another 3 off free kicks around the box. Fitzgerald went on to say, "I couldn't wait to get the second half started; we were switched on and smelt the blood in the water." And yes they did and went on to score 3 more goals. The 4 goals scored by the Lady Vikings where finished off by 4 different players with Emily Keoughan putting a Puente pass 1st time in the side netting to double the lead with 27 minutes to go. Marissa Baldasti delivered a ball across the box and as it struck the arm of a St. Agnes player a penalty kick was awarded and Gabbie Puente scored the PK on her 7th shot of the game. The Lady Vikings were up 3-0 and just about the time the Tigers saw some bounces their way, they were taking the ball out of their own goal as Baldasti was involved in another score on the day with her 11th goal of the season. Brennan Flynn was credited with the assist. "It was a dynamic performance for us today and we deserve another appearance in the Final Four," commented Fitzgerald. The Lady Vikings will take on Bishop Lynch on Tuesday, February 24th for a chance to play for their 5th TAPPS State Championship. This match will be played at 2pm at Southlake's Dragon Stadium. 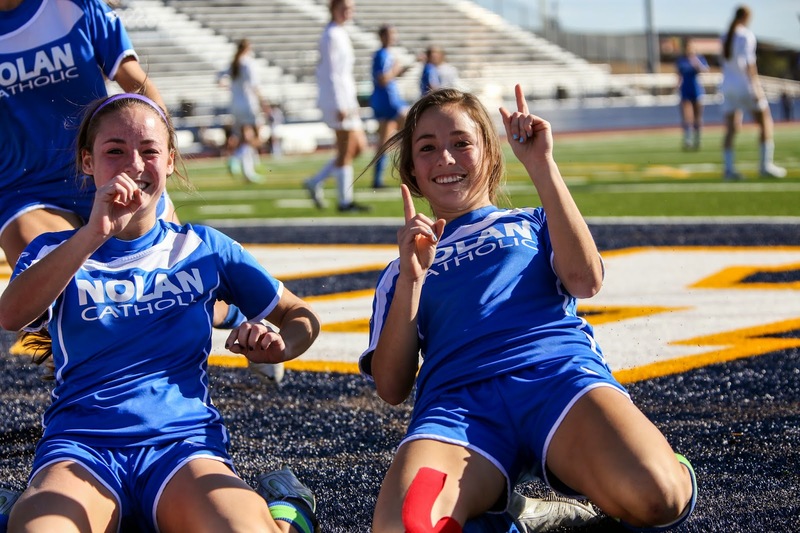 The Nolan Catholic Women's Soccer team will travel south to Waco for tomorrows match-up with Houston St. Agnes for a chance to advance to the TAPPS Final Four. Waco ISD Stadium will host the game tomorrow and will also be the location of the TAPPS State Championship the following weekend. The Lady Vikings take on the Lady Tigers tomorrow and will kick-off at 1:00pm. St. Agnes finished on top of District 3-5A with an 11-1-0 district record while the Lady Vikings were 13-3-0 with a 3rd place finish in District 1-5A. On the top of the TAPPS Playoff bracket is Ursuline Academy, Beaumont Kelly, Tomball Lutheran, and Incarnate Word San Antonio. Rounding out the bottom of the bracket along with Nolan Catholic and St. Agnes is Bishop Lynch and Liberty Christian. Team advancing to the TAPPS Final Four will play the semi-final match on Tuesday, February 24th. One down 3 to go for the Lady Vikings as they defeat Houston Awty International 8-0 today at home in front of another big crowd at Doskocil Stadium. The Nolan Catholic community comes out again for the Lady Vikings and they were not disappointed. Gwennie Puente started the excitement with her 1st goal in the 3rd minute of the game and then again in the 6th minute. Freshman, Megan Bettinger comes off the bench and puts her first touch in the net putting the Lady Vikings up 3-0 just before Puente complete her hat trick. The scoring continued with Emily Keoughan adding the next 2 goals giving the Lady Vikings a 6-0 halftime lead. LVS head coach, Jay Fitzgerald said, "Very proud of our team for setting the tone and playing to the crowd who we can't thank enough for the the support all year long." Marissa Baldasti and varsity newcomer, Mikaela Gamboa add to the Lady Vikings lead in the second half with their 2 goals. Improving to 22-5-0 on the year, Nolan Catholic is crowned Area Champion with the win over Awty today and look for their 27th Regional Championship on Saturday when they take on Houston St. Agnes at 1:00pm at Waco ISD Stadium. The 21-5-0 Lady Vikings are now 0-0-0 heading into the post-season which all gets started tomorrow. The Lady Vikings host Houston Awty Tuesday afternoon at 2:00pm. Nolan Catholic is coming off another impressive season outscoring opponents 130-25 and currently ranked #47 in the country, as high as #19. The Lady Vikings pride themselves on playing one of the most competitive schedules across the country. Head coach, Jay Fitzgerald said, "You have to play the best to be the best and our schedule has prepared us best for this moment." The 2015 TAPPS State Champion will have to win 4 games to be crowned champion and the Lady Vikings have in their sites their 5th title. The regional round continues on Saturday and the Final Four will be divided into 2 neutral sites over 1 week. The winner of tomorrows game will take on the winner of Prestonwood and St. Agnes. Come out a support the Lady Vikings Women's Soccer team Tuesday at home kicking off at 2:00pm. TAPPS 1-5A is one of the strongest districts in the state, not only for varsity, but for JV as well. Nolan Catholic hosted the 5th Annual TAPPS JV Tournament Championships. The teams put on a show in both semi-finals and the championship. Ursuline and Bishop Lynch started the event off in the first semi-final where Ursuline stormed out to a 4-0 halftime lead. Bishop Lynch did not back down and cut that lead in half in the first 15 minutes of the second half but Ursuline put the dagger in the Lady Friar comeback with their 5th goal of the day scored by Alyssa Sheldon. Sophia Schmidt started the scoring for the Lady Bears; Sarah Stuecheli added 2 of her own and Catie Caudle found the back of the net as well. The Bishop Lynch goal scorers were Christina Stack and Anisa Lopez. The real drama began in the second semi-final between #2 seed Nolan Catholic and #3 seed and defending tournament champions, John Paul II. Nolan Catholic took a 1-0 lead just 3 minutes into the match on a goal by Emma Hernandez off the foot of Mikaela Gamboa. The match was under control by the Lady Vikings until, Lady Cardinal, Margaret Synder evened the score with 9 to play in the first half. The Lady Vikings answered back just before the end of the half to regain the lead on a goal by Abbey Button. The wind was picking up and the Lady Vikings had the advantage until a PK was awarded to John Paul II and Synder even the score again. The match remained deadlocked at 2 despot the numerous chances by the Vikings, so overtime here we come. It is do or die moment for the Lady Vikings and they were determined to get finish this off. They did not want a repeat of last year as they were knocked off by #4 seed Bishop Lynch in last years semi-final. Golden goal underway, you score you win. LVS head coach, Alex Mechalske said, "We responded well in the moment." And that was exactly the case, with the wind and the clock ticking down in the first overtime period. With 17 seconds to go the Lady Vikings win possession off a John Paul goal kick and the ball ended up on the foot of Lady Viking midfielder, Selena Guzman and with the clock continuing to tick down, she unleashed a laser to the bottom left corner and today, the post was her friend and the ball rebounded in the goal for a dramatic 3-2 golden goal OT victory for the Lady Vikings sending them to the championship game later on that evening. Ursuline was the designated home team in the red tops and Nolan Catholic was the designated visitor in their blue tops but at Doskocil Stadium, home of the Lady Vikings. The match was a tail of 2 halves. Ursuline dominating the first half and taking a 1-0 lead and then the Lady Vikings dominating the second half and evening the score with 14 to play. Guzman, again, part of the the scoring when she sent a pass to Gamboa to take the match to overtime. Lady Vikings goalkeeper, Sarah Becan kept her team in the game early when she saved a penalty shot in regulation. A valiant effort by the Lady Vikings and total belief that they were going to win their 3rd TAPPS JV Championship but the Lady Bears ended the game just 7 minutes into the overtime period to claim the title, their 2nd overall. Mechalske added, "This year has been just that, Awesome! Our JV girls are 2015 TAPPS runner-up and we are extremely proud of their season." The Lady Vikings put up 7 on the night and all the scoring was by senior players. How fitting as tonight was senior night. It was a special night for 11 seniors and a manager who were recognized for helping the Nolan Catholic Women's Soccer Program to 72 wins, 2 Final Four appearances, a district title, 2 regional championships, over 430 goals scored, and a National ranking as high as #7. Gabbie Puente scored a hat trick while Jordan Gamboa, Marissa Baldasti, Kat Paul, and Gwennie Punete each added to the goal total on the night. The Lady Vikings were not answered and take their winning ways throughout the night as they improve to 21-5-0 overall. Piper gets her 15th shutout of the year and she had to make 4 saves. St. Stephens comes to town from Austin on Friday for a 4pm varsity kick-off. The TAPPS JV Championships begins tomorrow and the match-ups are set. The seeds are Ursuline, Nolan Catholic, John Paul, and Bishop Lynch. The seeds are listed in order from top to bottom. Seeds 1 and 4 will play at 11:00am and Seeds 2 and 3 play at 12:30pm. The championship is at 6:00pm. All games are being played at Nolan Catholic's Doskocil Stadium. The Nolan Catholic JV is seeded #2 and will take on John Paul II at 12:30pm. The LVS Class of 2015 will be recognized tomorrow night as the Lady Vikings takes their 20-5-0 record against HSAA. Kick-Off is scheduled for 7:00pm at Doskocil Stadium. There are 11 seniors that will be recognized tomorrow at halftime. Piper Head, Gabbie Puente, Gwennie Puente, and Sarah Brown have been on varsity since their freshman year racking up 71 wins in 4 years advancing to 2 Final Fours and winning a district championship. They have been ranked has high as #7 in the nation. Jordan Gamboa made a big splash earning her spot with varsity her sophomore season and since then is a point shy of 100. Rebecca Traynor spent time on varsity her freshman and sophomore year before winning a district championship with the JV last season. Defenders, Emma Birbeck and Clare Hennessy have spent the last 2 seasons on varsity helping the back line to 31 shutouts in just the last 2 years. Marissa Baldasti, Kat Paul, and Hannah Reeves have joined the varsity team for the first time this year accounting for 14 goals and 13 assists in just 1 season with the Lady Vikings. The TAPPS JV Championships will be hosted by the Nolan Catholic Women's Soccer this Wednesday. The Lady Vikings have wrapped up the #2 seed and will take on John Paul II if they beat TCA tomorrow night, if not, their opponent will be Bishop Lynch. The #1 and #4 seeds will kick off at 11:00am and Nolan vs the #3 seed will follow at 12:30pm. The winners will play in the TAPPS JV Tournament Championship at 6:00pm. All games will be played at Doskocil Stadium. The varsity concludes the regular season on Friday as they host St. Stephens on Friday at 4:00pm. The Nolan Catholic Women's Soccer team completed district play on Thursday night with a 2-1 comeback win over Ursuline. The Bears took a 1-0 lead in the 10th minute of play and the Lady Vikings responded with grit and determination. Going down a goal was exactly what the Lady Vikings needed. "We started strong, made a couple of mistakes and found ourselves in a hole," said LVS head coach, Jay Fitzgerald. The Lady Vikings were able to gain the momentum back for most of the half but the game continued to be back and forth. Both teams were creating chances but with 9 to play in the half, LVS forward, Emily Keoughan took an entry pass behind the line and was taken down by the Bears goalkeeper which resulted in a foul and a send off. Fitzgerald mentioned, "we responded to every circumstance very well tonight." The Lady Vikings took their man advantage into the second half and were able to equalize on a Gabbie Puente goal with a little more than 20 to play. Regan Hafer was able to capitalize off a corner that was headed back into the mix from Marissa Baldasti. With a 2-1 lead and the clock winding down the Lady Vikings were relentless with their defending as a solid Ursuline team wasn't going to let the game end without a fight. Nolan Catholic, goalkeeper Piper Head was fearless, cleaning up everything that came into her box; the backline was consistent and the midfield didn't give any of the Bears attackers much room on the ball. "Tonight was a true Nolan Catholic community victory; everyone that came out tonight played a role in our result," Fitzgerald said. The Lady Vikings improve to 20-5-0 and 13-3-0 in district play. With 2 more regular season, non-district matches left this week, the Lady Vikings learn their seeding going into the post-season after the remaining TAPPS 1-5A matches are completed on Monday. Senior night is Tuesday at 7pm against HSAA and then the Vikings host St. Stephens on Friday at 4pm. The JV will take their #2 seed into the playoffs. The TAPPS JV Championships will be played at Doskocil Stadium on Wednesday, Feb. 11th. The first game between the #1 & #4 seeds will kick-off at 11:00am with the #2 seeded Lady Vikings taking on the #4 seed at 12:30pm. The championship will be at 6:00pm. The Lady Vikings were back to back champions in 2011 & 2012. Congratulations goes out to seniors, Gwennie and Gabbie Puente as they signed their National Letter's of Intent yesterday to play college soccer at Texas Tech University. The will start in the fall. They have both been selected to multiple All-District and All-State 1st Teams, they have both won track and field State titles, they have both won Athlete of the Year Awards, and they have both paved the way for a exciting finish to their high school careers. Gabbie plays in her 100th game tonight and Gwennie scored her 100th goal a couple of weeks ago. "The are both driven by each others success and they are fun to watch; they have grown a lot in the last couple years," said LVS head coach, Jay Fitzgerald. The next challenge will be hosting Ursuline tonight at Doskocil Stadium. The JV kick things off at 5:00pm and the varsity comes in at 6:45pm. Come out and support your Lady Vikings and at halftime try your luck with an attempt to score a goal on Dean Duarte as he laces up the boots, puts on the gloves and jumps in goal. LVS had presence in Barcelona on Sunday afternoon, Phoenix on Sunday evening, and Dallas on Monday night. LVS Varsity coaches, Jay and Todd Fitzgerald witnessed some amazing sporting events over the past 24 hours. Coach Jay is on fumes and has started his journey back to the States. Barcelona Day 3 and 4 coming soon with more #lvsaroundtheworld pictures. Messi, Neymar, Iniesta and company took on Villarreal at Camp Nou, one of the most exciting SuperBowl finishes in the history of the NFL, topped off with the Lady Vikings Soccer program rattling off 10 goals between the 2 teams in their 3-0 JV win and 7-0 varsity win on the road at TCA tonight. Brennan Flynn got the scoring started for the Lady Vikings tonight with an assist from Gwennie Puente. Puente went on to score 3 goals of her own. Sarah Brown, Megan Bettinger, and Paige Rotto each scored a goal improving the Lady Vikings to 19-5-0 overall and 12-3-0 in district play. The Lady Vikings have clinched at least a 3rd place finish but can move up a spot to second with a win on Thursday and some help. The JV have clinched 2nd place in district play and will advance to the post season as the #2 seed and will play the #3 seed which will either be Bishop Lynch or John Paul II next Wednesday in the TAPPS JV Championships. Come out on Thursday night as the Lady Vikings return home to host Ursuline for a 5:00pm and 6:45pm kick-off. This is the final district game for the 2 teams. The varsity wraps up their regular season with a home match next Tuesday night against HSAA which is senior night for the 11 LVS seniors.